Oh, we’re back to Nazi references again. Last week, NPR’s Maria Hinojosa compared federal law enforcement officers to the Gestapo because they were doing their jobs. Hinojosa was on MSNBC with Ali Velshi to comment on President Trump “s**thole countries” remark that sent left wing America into full-blown meltdown mode last week. It became another angle to call Trump a racist. Even though one can argue quite convincingly that Somalia, one of the countries Trump listed in his executive order on immigration (aka the “Muslim ban”), is indeed a hellhole. Until Americans, especially liberals go to vacation in Somalia, South Sudan, or Libya en masse, I’ll just keep moving on with my day. Also, no one is going to vacation there. It’s the Access Hollywood reaction all over again. Intense for a few days, but it’ll be forgotten because these remarks are ultimately utterly forgettable. At first criticizing President Trump for his offensive comments about immigrants in the Oval Office on Thursday, Hinojosa pivoted to immigration enforcement as a whole. Hinojosa interrupted him, standing by her characterization. She also makes a dumb point that these ICE agents walk around with “police” on their vests, saying they’re misrepresenting themselves in the field. Immigration and Customs Enforcement is a federal law enforcement agency; they’re police. Also, she’s totally spreading fake news about ICE agents engaging in such activity. There are no checkpoints and random sweeps. This has been fact-checked by numerous news organizations. This was debunked back in February of 2017. President Trump's immigration plans are igniting fear in people across the nation who face the possibility of leaving the only country they know as home. Those affected by the plans worry that Trump's immigration policies could rip apart their families and the life they have in the United States. Fear can often spread misinformation about immigration and it's not uncommon to hear rumors about U.S. Immigration and Customs Enforcement (ICE) raids happening in communities. ABC10 reached out to ICE to verify whether or not their agents were in fact present at the location conducting a checkpoint. James Schwab, spokesperson for ICE, told ABC10 that ICE was not present or conducting a checkpoint in South Sacramento and in fact the agency doesn't ever set up checkpoints. "I don't think I've ever seen that," Schwab said. "It's not something we do at all." Schwab explained, ICE only conducts "targeted enforcement" where agents have an individual or individuals they are looking for. ICE doesn't ask people not targeted for any form of documentation and raids are always the result of targeted enforcement. Police and federal immigration officials said no such checkpoints are planned. They have received questions about it from people who saw information about the checkpoints on social media. Los Angeles Police Officer Mike Lopez said the only checkpoints in Los Angeles this Super Bowl weekend are aimed at drunk drivers. He said law enforcement agencies set up these checkpoints every year. Immigration and Customs Enforcement spokeswoman Virginia Kice said the checkpoint rumors have been circulating across the nation this week. She said that while the agency does run operations involving immigration enforcement, it does not create random checkpoints aimed at mass deportations. This nonsense is par for the course for a network whose sole job is to keep liberal blood pressures low and nurture the insufferable self-righteousness that infests the minds of American liberals. If you want a network that’s a total s**thole, watch MSNBC. 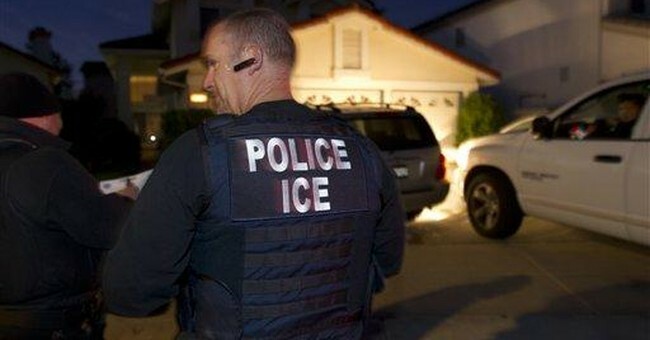 Our ICE agents are on the frontline enforcing the law and trying to keep bad people out. Deporting people who shouldn’t be here isn’t bad. It isn’t racist. It isn’t a harbinger for a right wing takeover. It’s the law. And it’s about time we had an administration that was serious about border and immigration enforcement. It’s one of the reasons why I voted for Trump. And it’s why I’ll vote for him again in 2020.